We can all agree it’s getting pretty warm out there. I’ve already switched up my skincare routine and i’m starting to swap my body and hair routines around too so I can look less of a sweaty mess and more of a bronze goddess (lololol). Anyway, I’m jotting down some beauty tips that I always follow whether I’m staying at home or jetting off on holiday, so I hope you enjoy! One: Scrub Scrub Scrub | Similarly to dry skin in the winter, skin gets just as gross in the summer. If you’re somewhere especially warm, make sure you exfoliate your skin regularly to get rid of any congestion and dead skin cells. It’s also a great step if you’re a fan of the tan too, as I mentioned in this post. 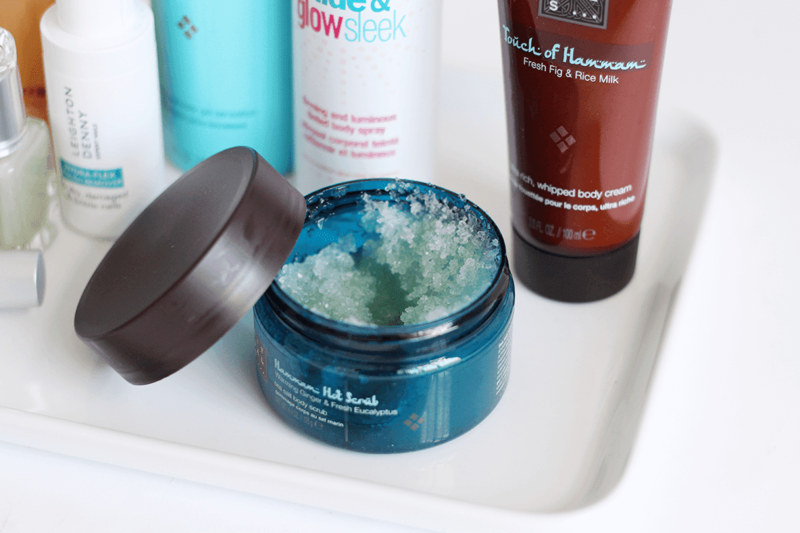 I really like the Rituals Discover Hammam Set, as it has a beautiful shower gel, body cream and this amazing ginger body scrub in it. Two: Don’t Forget Your Nails, Hands and Lips | Often we get a bit obsessed with the rest of our body looking good in summer that we forget about the basics. The sun can dry your lips out terribly and they need protecting as much as anywhere else, so try to buy a lip balm with an SPF and apply regularly! Similarly with hands and nails, don’t forget to apply SPF to your hands and treat your nails (especially if you’re swimming a lot). The Leighton Denny Hydra-Flex Nail Treatment works well at strengthening and restoring your nails. 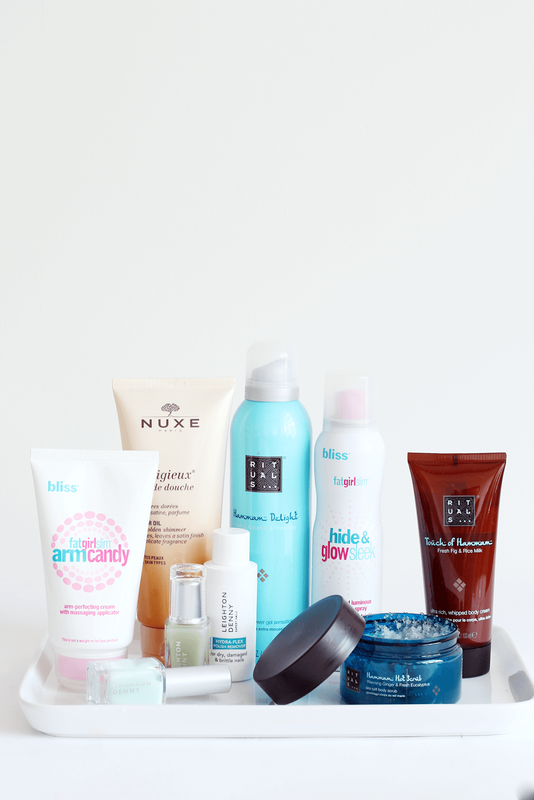 Three: Hand Luggage Beauty | If you’re off on your holidays, make sure you pack the essentials in your hand luggage. There’s a slim chance your bags will go missing, but just incase, take enough sunscreen (even if you have to pick it up in Duty Free! ), maybe some wips and essential makeup as a backup. Make sure you’re aware of the land luggage allowances before you go though! Four: Quick Showers | I know this sounds ridiculous and glaringly obvious, but one thing I love doing in summer is having quick, cool showers every day. I can’t stand feeling sweaty (probably why I hate the gym so much!) and gross, so it’s the best way to feel instantly refreshed! It’s the one time I indulge in my shower gels so I can get a luxe treat in the five minutes that I’m in there. My current favourite is Nuxe Prodigieux Shower Oil, as it smells divine, followed by Bliss Fatgirlslim Hide & Glow Seek which tones the skin and gives it a lovely shimmer and Bliss Fatgirlslim Arm Candy which targets my arms, which is especially good after I’ve been out in the sun! Five: Drink! | If you’re gonna be outside a lot this summer – drink some bloomin’ water! Cocktails in the sun are nice, but remember alcohol isn’t exactly the best at hydrating you so make sure you’re drinking some water too. I try and have around 2ltrs a day if I can, as, not only does it do wonders for you skin, but it’s super duper essential in warm weather to keep you going. I have a tendency to pass out in summer when I’m dehydrated, so I know how important it is!